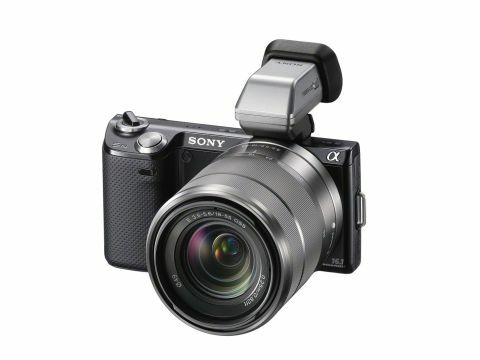 The second generation Sony NEX-5N sits in the middle of a revamped NEX compact system camera (CSC) range, just above the NEX-C3, with which it shares a 16.1MP effective resolution, and some way below the 24.3MP effective NEX-7. It follows on from the entry level NEX-3 and mid range NEX-5, introduced in summer 2010 as Sony's first-ever interchangeable lens compacts. Outwardly, the slender, Russian tractor factory-approved body design isn't a massive departure from its plain-looking predecessor. Indeed, while its low profile shape when compared to the rival Olympus PEN, Panasonic GF and Samsung NX series has reportedly made the fledgling NEX range a big hit in Asia, the combination of slightly more conventionally styled bodies plus smaller lenses means that competing systems such as Micro Four Thirds have gone down slightly better in the West. Will the Sony NEX-5N, progressing Sony's hard sell combination of small body yet large optics, be the one to take the range to the next level? On paper at least, the NEX range has a key advantage to draw in the photo enthusiast - namely its incorporation of APS-C CMOS sensors, a size match for those found in DSLRs. These are much bigger than the Micro Four Thirds sensors used by Olympus and Panasonic, and those of the new Nikon 1 J1 and Pentax Q interchangeable lens system cameras. Of course a larger sensor when combined with bigger glass in front of it theoretically delivers the best quality images. So can the Sony NEX-5N impress in use and transcend its unassuming exterior? Newsworthy differences between the plain old Sony NEX-5 and the NEX-5N include an upping of the headline resolution from 14.2MP to 16.1MP, albeit courtesy of the same APS-C format sensor, plus an ISO boost from a maximum ISO 12800 to ISO 26500, due to what Sony claims is a new Bionz processor. There's still no integral flash, but once again there's a small clip-on option that slots in above the lens mount. The back screen LCD thankfully remains tilting, but this time it offers the touchscreen facility that we felt it should have had originally, the large onscreen function icons lending themselves to an inquisitive prod. The pivoting monitor in the absence of an adjustable electronic viewfinder is useful for high or low-angle compositions, and led to us taking the kind of shots we might not otherwise have attempted, while avoiding grubby knees. But the three-inch, 921k dot resolution screen's use remains slightly restricted. It can't be flipped out through 180 degrees so it's parallel to the body, like on a camcorder. Nor can it be flipped to face the user as they peer into the lens for a self-portrait, or turned screen inwards to the body for added protection. Another flagship feature is the Sony's respectably swift 10fps continuous video capture speed. This is up from the already impressive 7fps of its forebear, albeit operating at a fixed focal point, while alternatively making sure our subjects remain sharp wherever they are in the frame. This is 25 point contrast detection - as opposed to phase detection - auto focus. With 1200-zone evaluative metering instead of the 49-segment metering of the NEX-5, its maker also claims a shutter lag of 0.02 seconds, so it's five times faster than its older sibling. Subtle tweaks perhaps, but in operation the Sony NEX-5N really seems to fly. The signature Sweep Panorama mode also seen on Cyber-Shot models again features, here generating up to 23MP images. There are both 2D and 3D versions, the latter only viewable on a suitably equipped TV, both of which stitch together a rapid-fire sequence of images to automatically deliver a single elongated image. Again this works well, and is effortless. Pan with the camera in the direction of an onscreen arrow through an arc and the Sony NEX-5N will do the rest. Another neat feature retained is background defocus, so users can achieve that attractive shallow depth of field effect to soften background clutter and make foreground subjects really jump out of the frame. The intensity of said effect is controlled by simply dragging a point on a slider. Finally, Full HD 1920 x 1080 pixels video capture again features, with a dedicated red record button to commence its capture. There's a choice of AVCHD or more widely compatible MPEG-4 file formats, the latter necessitating a resolution drop to 1440 x 1080 pixels due to it applying less compression. While we don't get the accessory shoe of the NEX-7 or modern gimmicks such as GPS, the Sony NEX-5N very definitely has most feature boxes ticked.